Leonardo Quilietti born 27 November 1838 died 30 January 1904 the forefather of the Quilietti family. 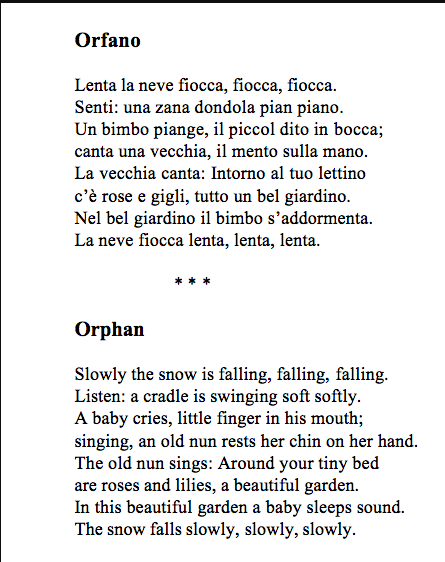 Leonardo was born on a cold November afternoon in a little village lying just outside Lucca. News from Italy, in 2017 has given us more insight into why he was raised by the Catholic Church. Leonardo’s mother was called Maria Maddelena Franchi. 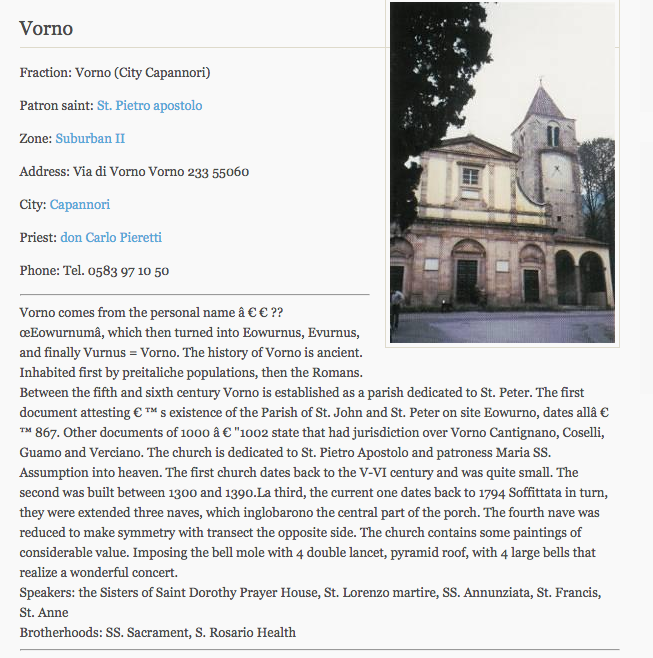 She was the daughter of Francesco Franchi [and he was the son of Bartolomeo Franchi] all residents of the village of Vorno, Lucca, Italy. Their church was the Church of San Pietro the Apostle of Vorno, the Comune of Capponori, Lucca. 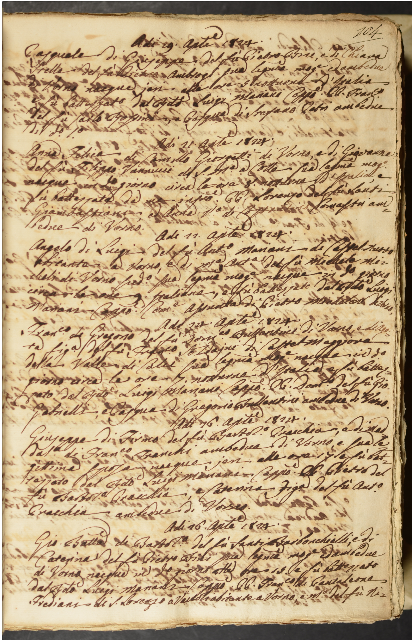 Maddalena stayed in the village and on 26th October 1820 she married Firmo Praccia. Praccia was a name common to this area and as is stated below the cemetery is full to bursting with people who are of this particular Clan. Their children came along almost yearly. I always knew of two daughters but now thanks to the Church sending information we know that Leonardo also had two brothers. MARIA FRANCESCA was next born on 16th September 1822 and baptised the following day. She died on 4th February 1829 aged 7 years. 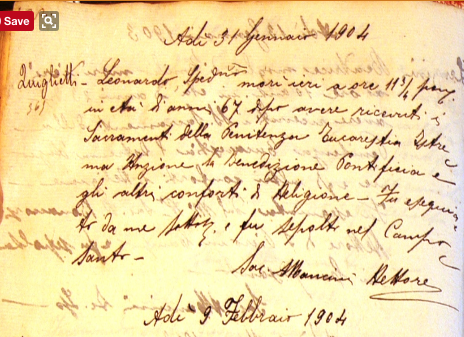 FRANCESCO was born on 16th September 1828 and baptised the following day. 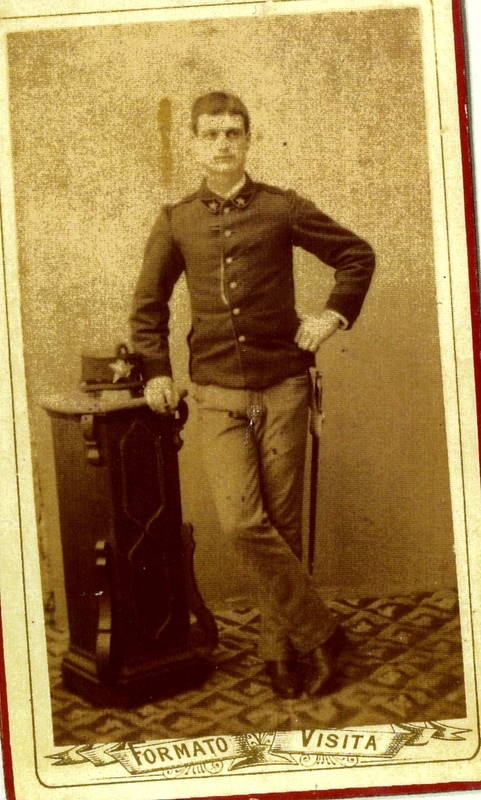 Francesco Praccia was born on 17th September 1828 and baptised the following day . He died the following year. I now know that Maria Maddelena was widowed sometime after 1828 and 1837 when Leonardo was born. Frowned upon by the Church at this time the circumstances of the boy’s birth were not good. Maria Maddelena died due to complications of childbirth on 26th November 1838. 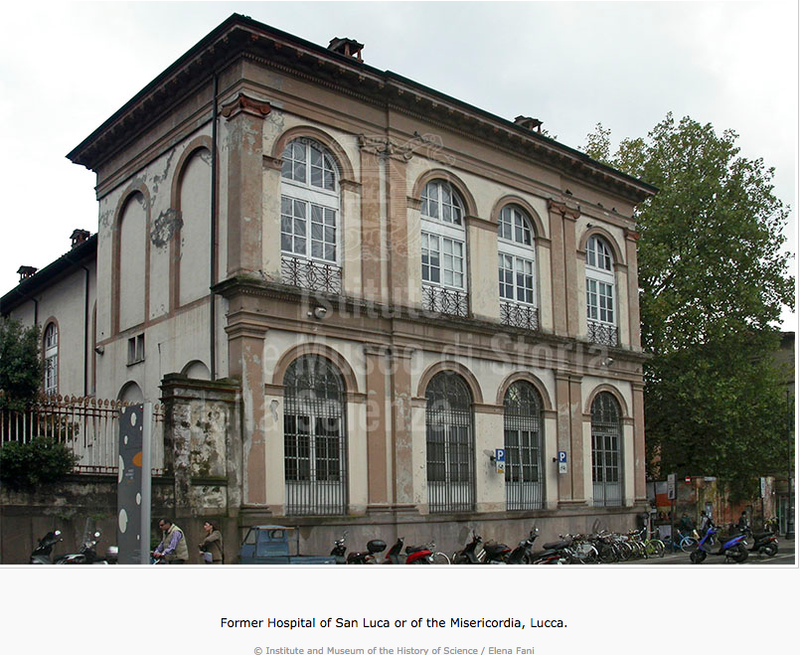 Another twist in the tale was that her eldest daughter Annunziata, who may have possibly been able to bring the boy into the fold of the family, also gave birth to a baby boy who was given the name SATURNINO PRACCIA on the day after Maria Maddalena died, 28th November 1838. This baby was also born out of wedlock. Saturnino would have been our Leonardo’s nephew. I am not sure of the outcome of this boy. Would he have also been given to the church to be brought up in the orphanage, or would she have kept him with her other siblings and brought up in the family? 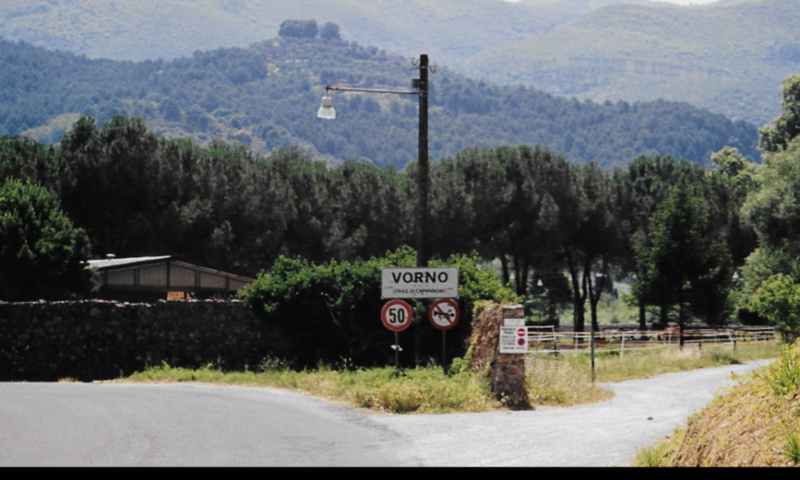 The village of Vorno and the district was home to many families with the surnames Olivieri and Praccia. However the new surnames of Franchi and Barbonchielli I will now have to research. 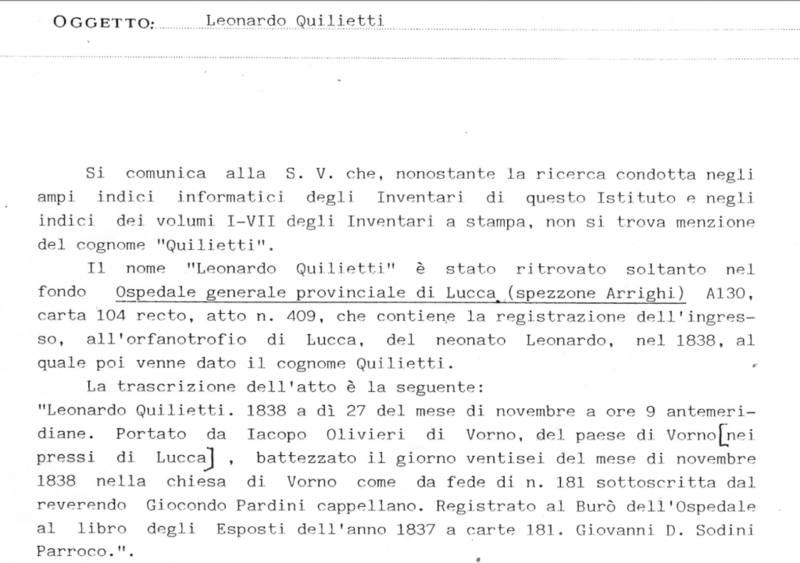 ‘Leonardo Quilietti’ 1838 on the 27th of the month of November at 9.00 in the morning. Brought in by Iacopo Olivieri of Vorno from the Village of Vorno. 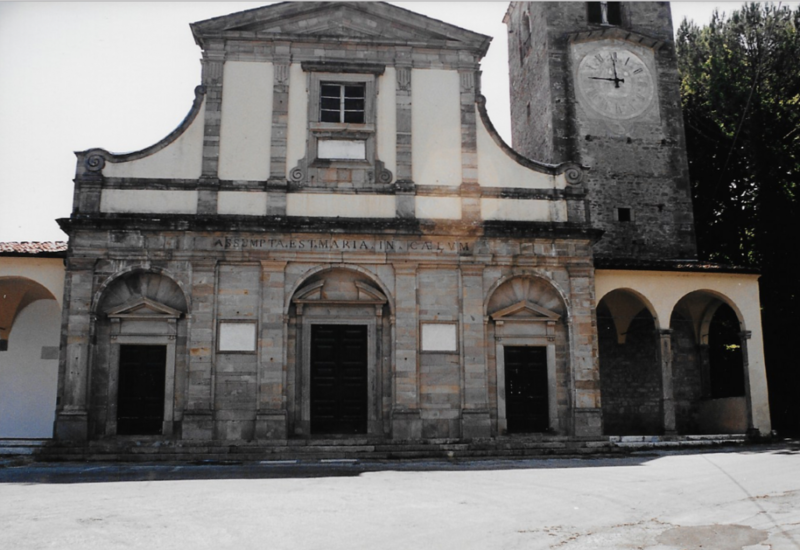 He was baptised on the 26th of the month of November 1838 in Vorno’s Church as witnessed by Reverend Giocondo Pardini [Chaplain] Act. No. 181. 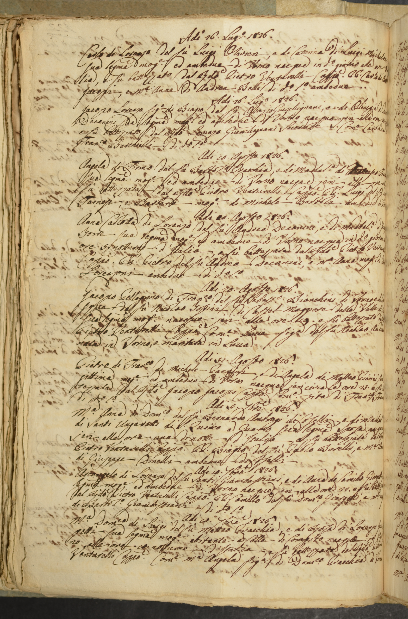 Registered at the Hospital Bureau in the Public Book of the year 1837. Paper No. 181 Giovanni D. Sodini, local Priest. 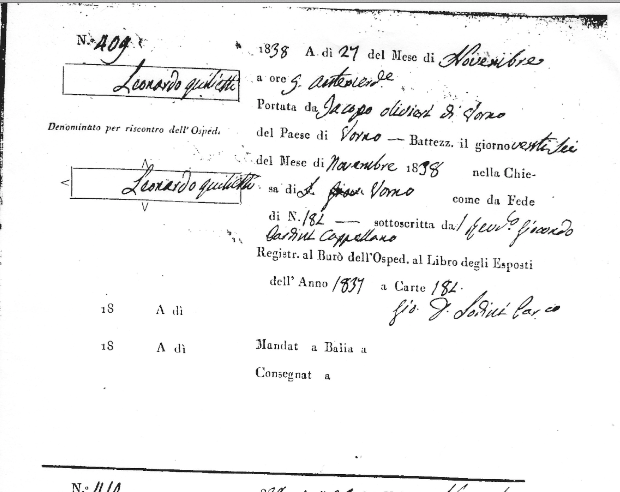 Official Record of the founding Leonardo Quilietti. 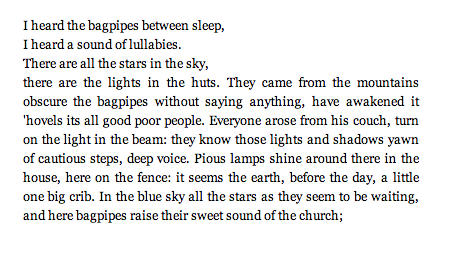 The Orphanage would have presented Leonardo with his surname, although he was always Leonardo, born on the Saints Day. So the mystery deepens. 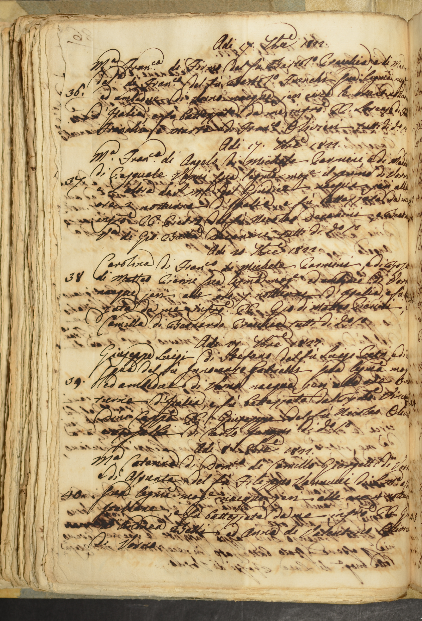 Who was Iacopo Olivieri. Another family prevalent in the town of Vorno as is proof in their cemetery which is overflowing with residents. 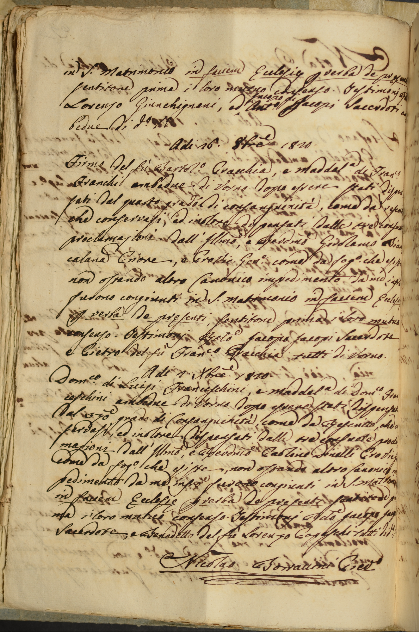 Perhaps Iacopo was Maria Maddalena’s partner, someone who looked after her and her children after the death of Firmo. Unfortunately we shall never know. 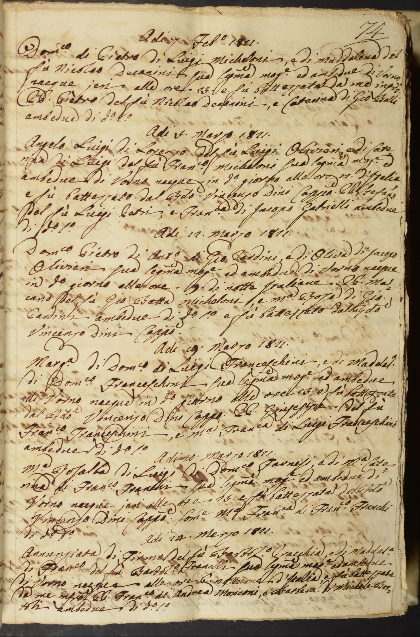 I did find Iacopo Olivieri and know that he was a farmer. 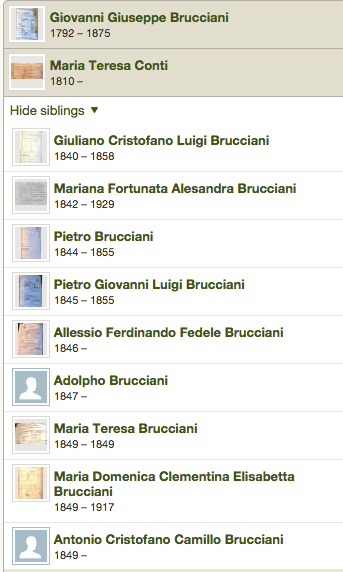 He had two daughters, Annunziata and Maria Francesca in the census information I found for him. Bizzarly this is the names of Maria Maddalena’s two daughters. The death of Maria Maddelena on the birthing bed would not have been pleasant for either lover or midwife. Iacopo Olivieri is another route I am still investigating. Perhaps DNA will come through for us. In the orphanage he would have been brought up as a devout Catholic. He would have learned a trade. When he reached Eighteen years he would have been free to leave his home and make his own way in life. The year would have been 1856. 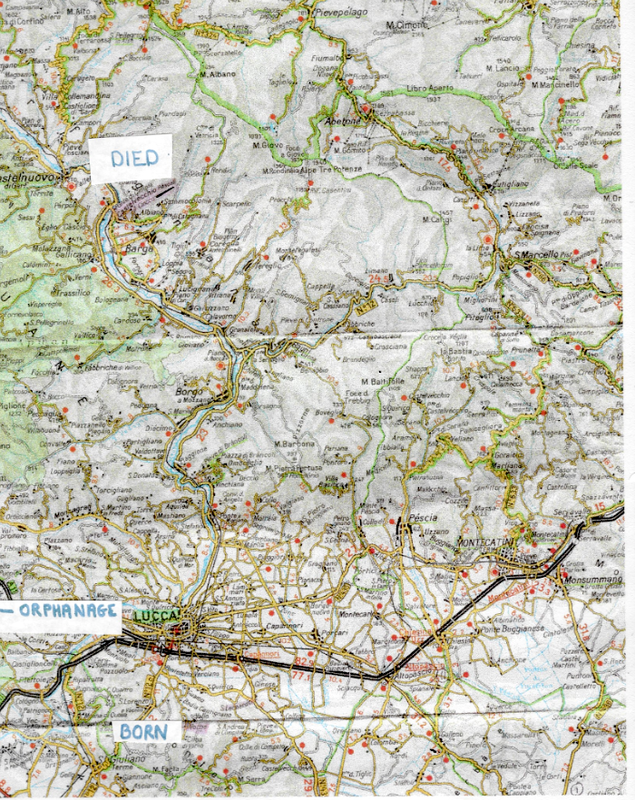 We know he travelled a bit further North in the Lucca area to the town of Barga. Certainly the marble mines nearby could have been his source of employment. 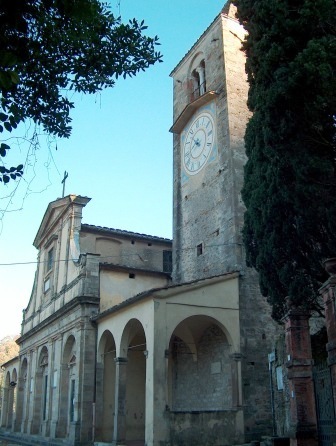 Whatever route he took Leonardo settled in the Barga region and the marriage between Leonardo and Eletta Brucciani took place in the Church of St. Nicolo’ in Castelvecchio, now Castelvecchio Pascoli. The date was 1st December 1866. 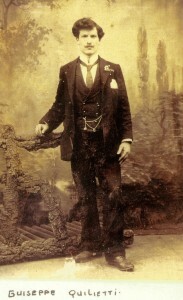 He was 28 years old, late by Italian standards to be married for the first time. 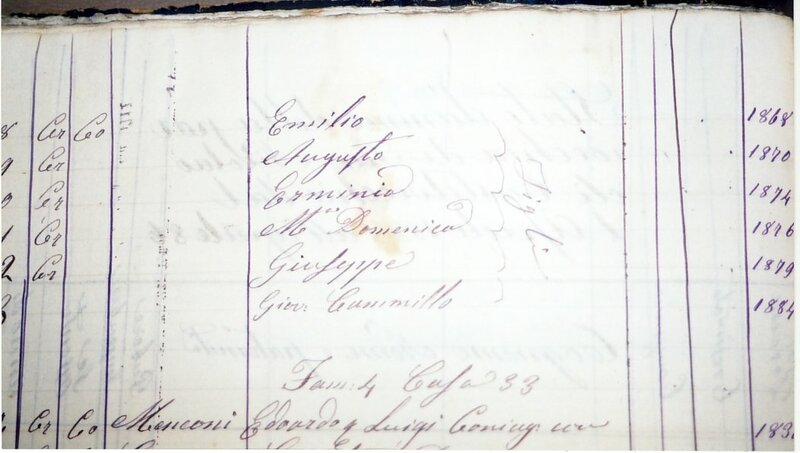 Maria Giovanna Eletta Maddalena Brucciani , known as Eletta was six years his junior and was also born on 26th November, but in the year 1844. 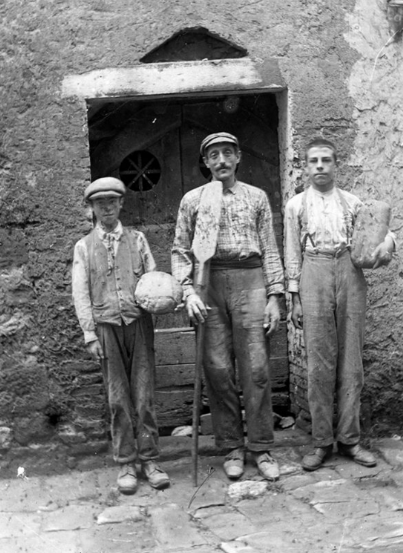 Shewas one of a large family of Bruccianis who lived in the village of Castelvecchio, outside Barga. 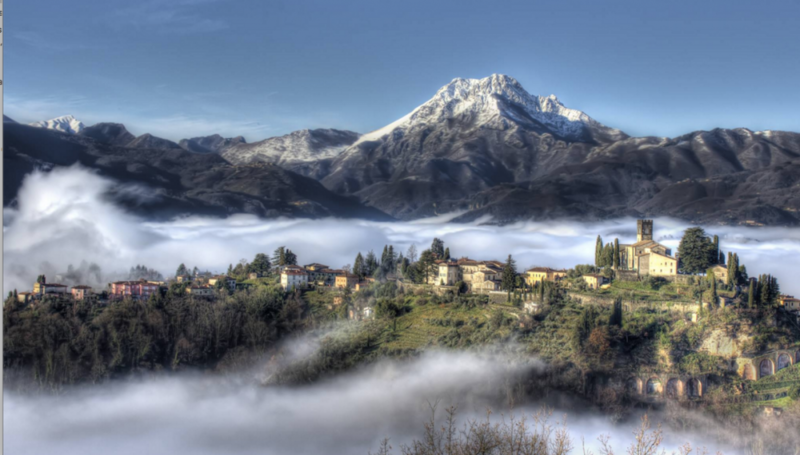 This area surrounding Barga and the Serchio Valley is a mysterious and fascinating corner of Tuscany, close between the Apuan Alps and the Apenine Mouintains. It takes its name from the River running through it for its entire length and then with a thousand streams running into it which creates deep gorges and a wonderful visual phenomena. 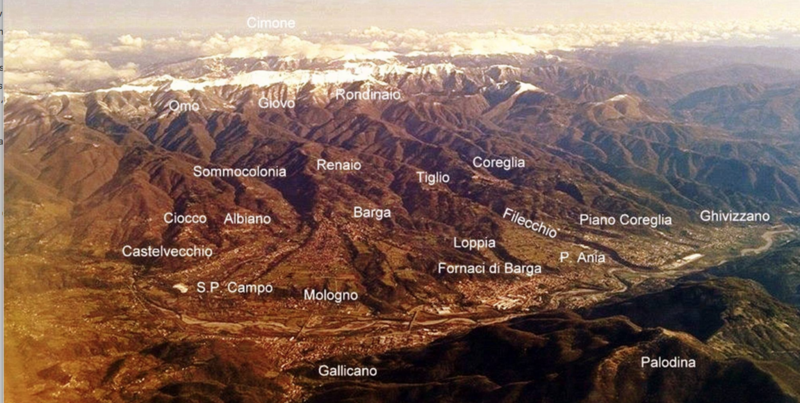 The Capital of this region of beautiful Barga. 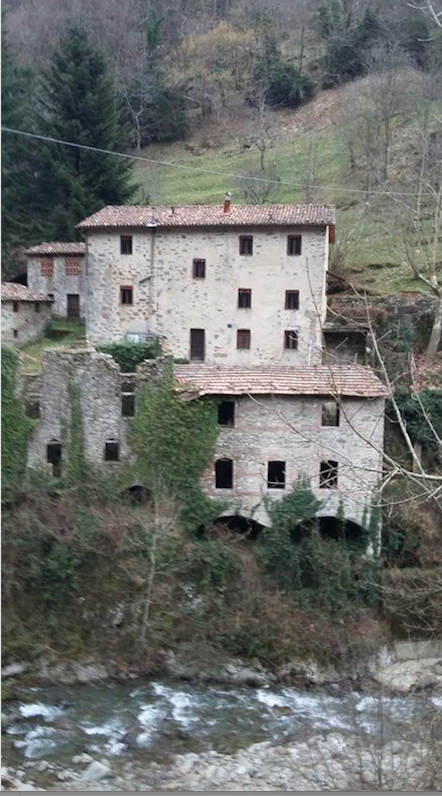 Our Castelvecchio is wher the famed poet Giovanni Pascoli lived out his life and which area inspired much of his work. And the food of the region is one of wild mushrooms and chestnuts. 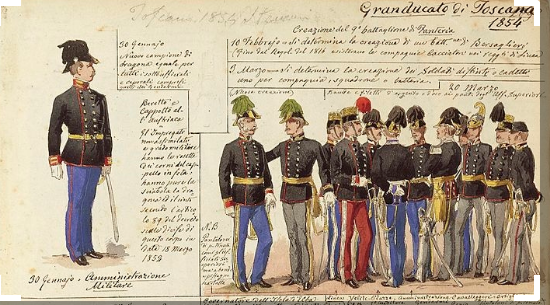 Of course there may have been a possibility of Leonardo being drafted into the Tuscan Army at this volatile time during the Unification of Italy. Leonardo would have been the right age after he was discharged from the orphanage at 16 or 18 years. The children came along like little stepping stones. 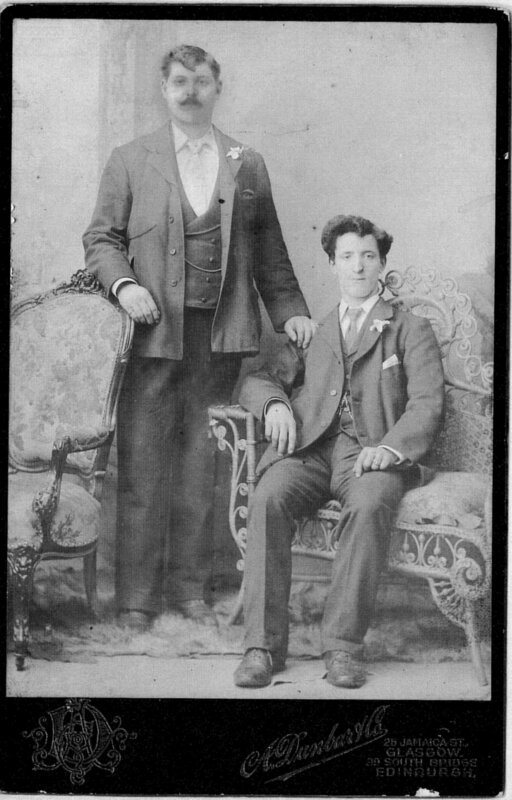 Luigi Adolpho was born on 5th August 1867. 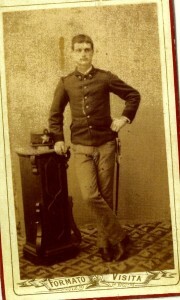 He died on 5th May 1869. Emilio Fedele Leopoldo came next and was born on 15th August 1868.
was born on 20th October 1870 . 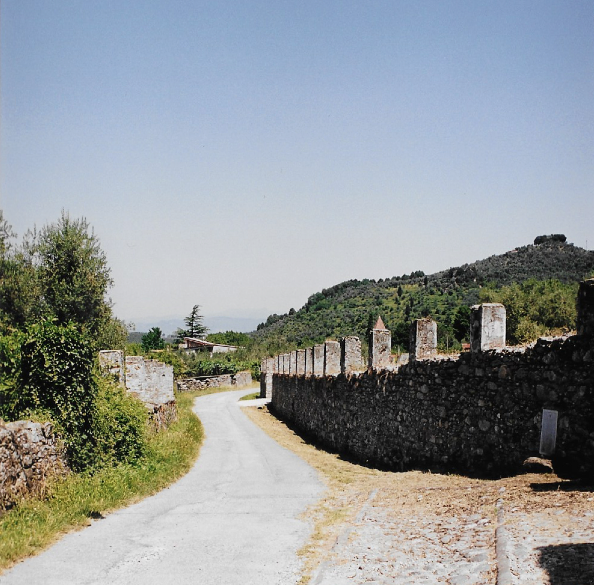 He married into the Arpino family from the Picinisco area of Italy and also settled in Scotland. He only had two children. Erminia died in childhood and daughter Angelina. Angelina married John Arpino also from the Picinisco area and their ancestors now live mainly in the Pathhead area of central Scotland. 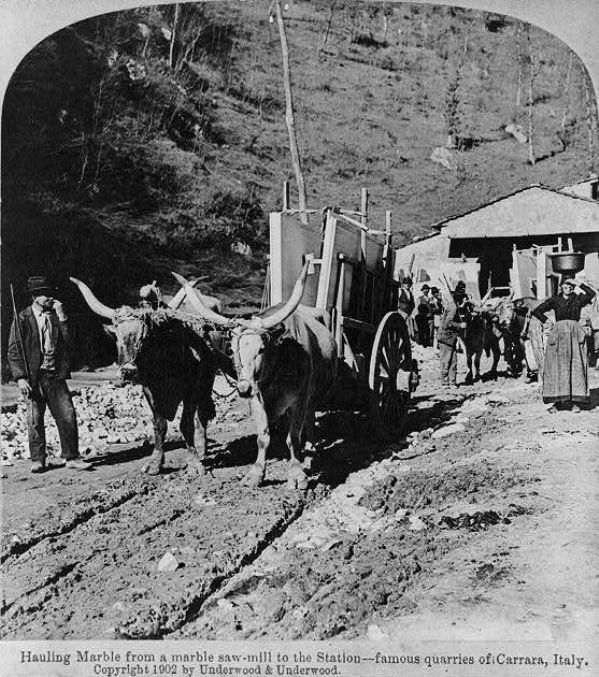 Maria Giuseppa Ermenia Quilietti was born on 27th May 1874 in the village of Castelvecchio. 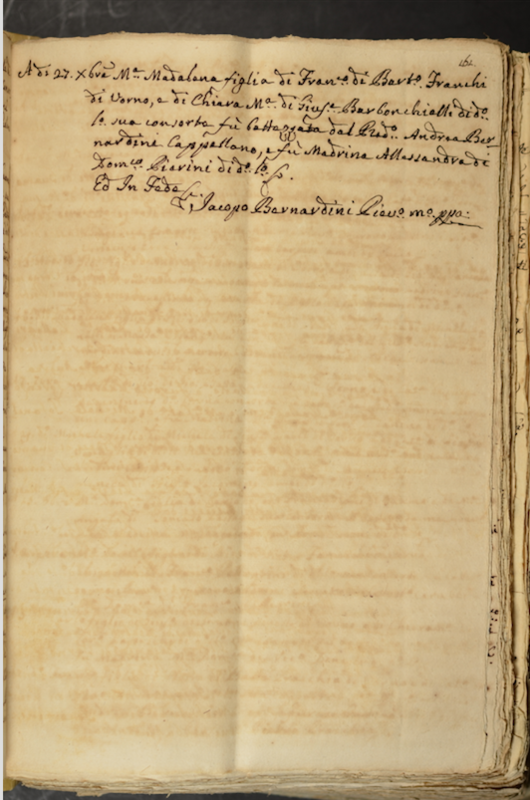 Ermenia emigrated to Rhode Island in the U.S.A. 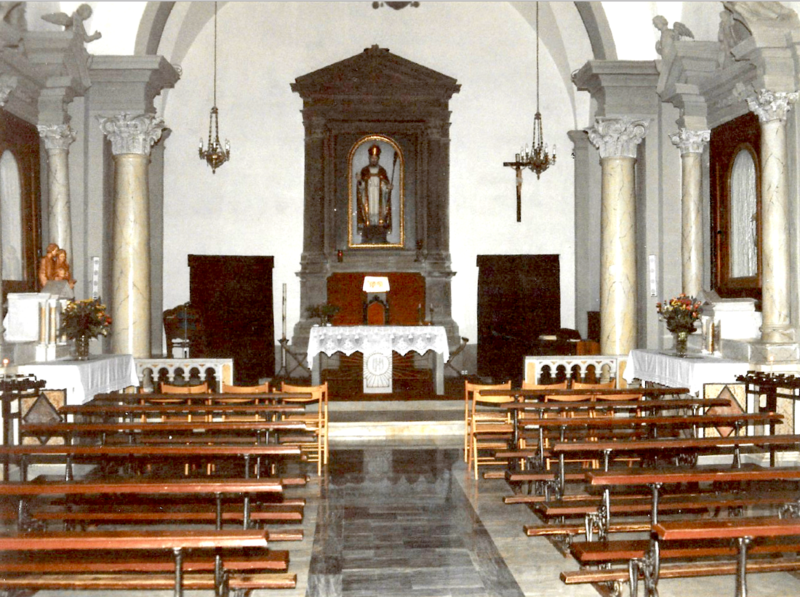 Here she married her first-cousin Pietro Dante and they had four children of whom two daughters surviv Both daughters lived into their 90s. They both married but had no children. So the line dies out. 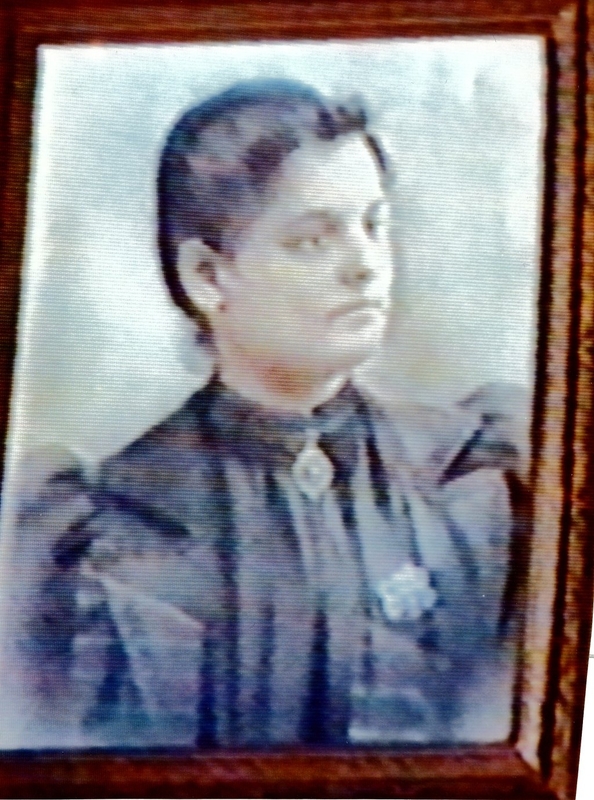 Maria Alfonsa Disvira Quilietti was born on 10th January 1876. 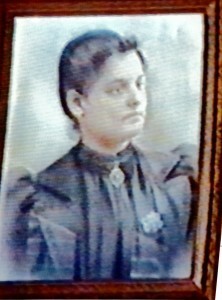 Maria also followed her siblings to Rhode Island in 1903. 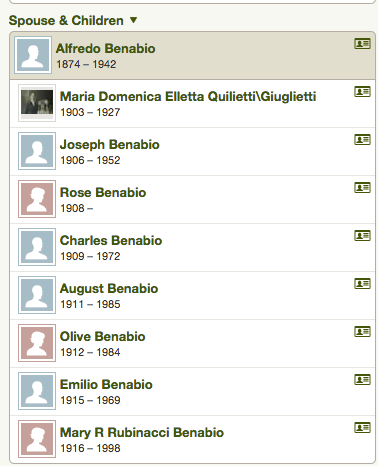 She married Alfredo Benabio in the U.S.A. and there are her ancestors alive in Rhode Island today. was born on 10th October 1879. He travelled the Atlantic Ocean on many occasions before finally settling in Rhode Island in the year 1911. He married Leonara Raffanti. They had no surviving children and his line dies out. Giuseppe died in 1971 and was the longest surviving of Leonardo’s children. Adolpho was born on 7th August 1884. He never married. He died in a tragic accident on 16th February 1943. Whilst in the basement of their shop in Rhode Island there was an accident with gas fumes from which he unfortunately died. As far as we know he had no children and his line dies out. 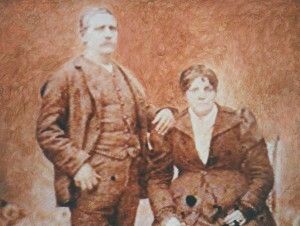 The picture above is of Leonardo Quilietti and Eletta Brucciani taken in Barga in 1896. Eletta died two years later. Leonardo died in the year 1904. 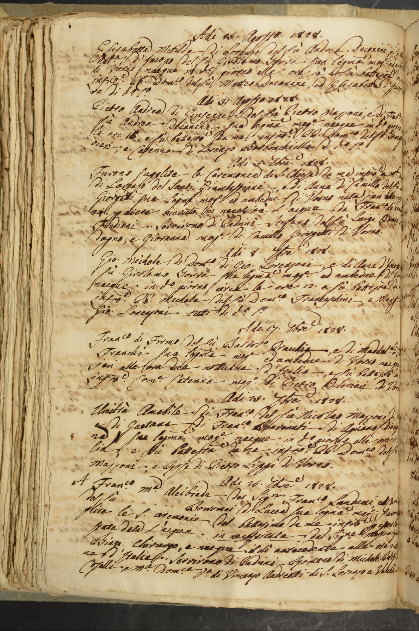 Our Quilietti family history has unfolded into an interesting account of the Italian people around about the time of the unification of Italy. We have been humbled to learn of these hardworking people who strived to better their families and who left behind a paradise in search of their goals. We have learned a little of their lives and their family connections and descendents. This is our unique family history and their ancestors who now are now scattered throughout the continents have much to be proud of.